CHATEAU ISTANA (GB) (Chestnut 2002-Stud 2007). 5 wins-3 at 2-at 1000m, Doncaster Flying Childers S., Gr.2. Sire of 114 rnrs, 74 wnrs, inc. SW Golden Chateau (Turffontein Gauteng Guineas, Gr.2), SP Homehill and of Fusil de Eve, Mentor, Bastille Knight, Idance, Manor House, Chaste Angel, Shoulda to Shoulda, Marksfield, Notabitofwhite, Wishful, Aspy Bay, Olympia's Flame, Apistanna, Brave Flying Hawk, Robert's Magic, Valiant Fighter, Chateau d'Or, etc. Homehill (g. by Chateau Istana). Winner. See below. Generis Heart (g. by Show a Heart). 4 wins from 1850m to 2200m to 2014-15, BRC Drumbeats at Lyndhurst P., 2d BRC Racing Retro P.
Tatt's Lucky (f. by Bradbury's Luck). Winner at 1200m in Aust. Unique Flyer (f. by Jet Spur). Placed in 2014-15 in Aust. Hasta Pronto. 3 wins at 1300m, 1400m, A$77,392, 2d STC Grand Pavilion 2YO H., MRC Betfair H., 3d AJC Soho Square 2YO H., MRC The Chase Hotel 2YO H., Rancher H., Maple H.
SKYTRAIN (Lonhro). 9 wins-1 at 2-to 1300m, A$707,300, ATC Southern Cross H., Gr.3, Canterbury Classic, L, Show County H., L, AJC Stargazer 2YO H., ATC Ingham Chicken and Turkey H., STC Ranvet H., Denman Hotel Thredbo H., Marshall Motors H., Whites Wires H., 2d ATC Expressway S., Gr.2, Hall Mark S., L, At Sea H., Westend Mazda H., STC Hutchinsons Builders H., Top Cut Steaks H., PJ Gallagher's Irish Pub H., 3d ATC June S., L, Carrington S., L, STC Jacob's Creek Moscato H., AJC Professor Chris O'Brien AO H., ATC Canterbury BMW Financial Services H., 4th ATC Starlight H., L, Scone Quality H., L, Gosford RC Takeover Target S., L.
Admissions. Winner at 1200m, QTC Bore Head H., 3d QTC Faustina H. Producer. Omniscient (Exceed and Excel). Winner at 1100m, A$121,165, ATC Pluck at Vinery H., 2d Scone RC Denise's Joy S., L, ATC Ainsworth Gaming Technology H., Become an ATC Sponsor H., 3d VRC Cap d'Antibes S., L, ATC More Than Ready H., Wildfire Restaurant Sprint H., Become an ATC Sponsor H., Australian Turf Club H.
Auspices - Happy Go Lucky (H.K.). 4 wins-1 at 2-from 1200m to 1650m, A$76,280, HK$1,822,000, STC MTA Medical Services 2YO H., HKJC Johnston H., Tsui Ping H., Po Tat H., 2d AJC Seppelt Wines 2YO H., HKJC Shek O H., 3d STC Spring Valley Twist 2YO H., HKJC Hankow H., Kennedy H., Sunset Peak H., Mr Con & Ms CSI Come to ATV H., Admiralty H.
Tages. Winner at 2000m, 2d AJC Randwick Betting Auditorium H., Sky Heights H., Homestead H., 3d STC PJ Gallagher's Irish Pub 2YO H., AJC Sydney City Toyota H.
Fated. 3 wins at 1200m, 1250m in Aust. Bokrah. 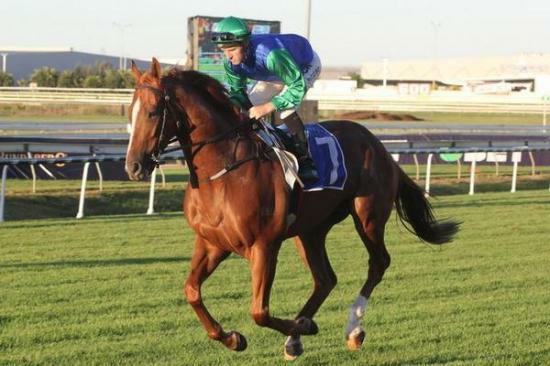 2 wins at 1000m in Aust. EREWHON (Commands). 4 wins at 1600m, 2000m, A$407,430, AJC Spring Champion S., Gr.1, Centennial Lawn Suites H., ATC South West Kerbing H., 2d STC Gloaming S., Gr.3, ATC Bowermans Office Furniture H.
Inside Trader. 7 wins to 1300m, BATC Vo Rogue H., Carrington Champagne H., 3d BATC Gunsynd H.
Race Record: 17 Starts 1-5-1 A$114,400. Winner at 1200m, A$114,400, in 2014-15, BRC Carnival Ball H., 2d Qld Tatt's RC Breakfast Creek Hotel S., L, GCTC Sky Racing H., BRC PMP Brisbane Town P., 3d BRC Watpac Specialty Services 2YO H., 4th BRC Gold Edition P., L.